I once commented to someone that I would like to be clairvoyant rather than claircognizant. “I used to have clairvoyance envy too,” she replied. Her remark hit home, and I considered that I should probably appreciate what I had, but I continued to want to improve my skills in the area of clairvoyance. What I learned since then is that, even if clairvoyance is not your main channel of communication, with practice, you can improve it to the point where you can get decent results with it. Definitions of clairvoyance can vary, but the word itself means “clear seeing.” According to UK medium Craig Hamilton-Parker in his book Opening to the Other Side, mediums receive information from spirit through visual images, and this is what they consider to be clairvoyance. Debra Lynne Katz provides a formal definition of clairvoyance in her book You Are Psychic. She describes clairvoyance as “a specific psychic ability located in one’s sixth chakra, or third eye, that involves accessing information in the form of images, visions, and pictures” (Katz 308). The third eye is the area on the forehead located between the brows. It is considered to be your psychic centre. Doreen Virtue, PhD, teaches that you can recognize clairvoyant messages in a variety of ways. In her book, The Angel Therapy Handbook, she says that many people assume that when you see angels or receive clairvoyant visions, it is in the form of solid, three-dimensional figures that are outside of the head (Virtue 65). While it is possible, with practice, to get to the point where the images are outside of the head and three-dimensional, most of the time they are similar to the mental images you see when you meditate, dream or daydream. In my case, I don’t see clear images, but I get what I refer to as impressions. Impressions are visually vague but can be highly detailed. For example, I once received an impression of a crocheted doily while practicing mediumship. I couldn’t see the doily vividly, but I could get a good enough impression of it to describe its shape, colour, size, and pattern. Some people consider orbs in photographs to be clairvoyant images of spirits or angels that are invisible to the naked eye but are made visible by the flash or by the capabilities of the camera. There are many reasons why you may see orbs in a photograph, and most of them are physical rather than paranormal. If you think you have captured a spirit in a photo, it would be best to consult a photo expert or a professional paranormal investigator familiar with the conditions under which dust specks and not spirits create orbs. During a reading, I find myself looking down and to the right when I receive images. This isn’t necessarily the case for everyone, but in my case, I have found that I receive the images better when I look down and to the right, perhaps because looking towards the floor removes other visual distractions from my line of sight. Many people find it helps to close their eyes when first beginning to develop their clairvoyant abilities. Some people find it helpful to use tools to aid them in receiving clairvoyant images. 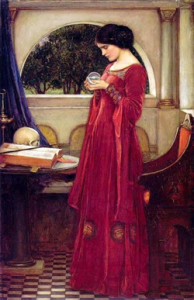 Crystal balls or other scrying tools provide a medium for viewing images. The lighting should be low when using anything with a reflective surface, and it takes patience and consistent practice to become proficient with such tools. Meditation is an excellent way to open yourself to receiving clairvoyant information. When you relax and allow your mind to clear, then it is easier to allow the information to flow. You can set an intention at the beginning of your meditation or ask a specific question to which you would like an answer, and see what comes up as you meditate. You can also do the same with dreams, which can be another way of receiving clairvoyant messages. If you set your intention or ask your question before you go to sleep, you can receive information through your dreams in response. It is important to keep a dream journal, pen, and flashlight next to your bed to write down any dreams you have immediately upon awakening, so that you don’t forget them, and can review them the next day. With practice, anyone can improve psychic seeing abilities. There are many excellent books out there with helpful exercises that you can do to practice and improve your clairvoyant vision. Workshops can help as well since they combine theory with practice. However, the best way to improve is to do it, so if you really want to challenge yourself, then acquire a set of Oracle cards and do readings for yourself and your friends and family. Giving readings forces you to build awareness of how you receive messages and to recognize the messages when they come in. But the most important thing to remember when working to improve your psychic abilities is to have fun with it. When you try too hard, cliché though it is, the more difficult it becomes. When you relax and have fun, you are allowing it to flow naturally. Viewing it as play rather than work or a test also gets your ego out of the way. The more you think you have to succeed, or the more you want to impress yourself or someone else, the less success you will have with it. Play, and you will be amazed at your progress. Hamilton-Parker, Craig. Opening to the Other Side: How to Become a Psychic or Medium, New York: Sterling Publishing Co., INC., 2005. Katz, Debra Lynne. You are Psychic, Woodbury, Minnesota: Llewellyn Publications, 2007. Virtue, Doreen. The Angel Therapy Handbook, California: Hay House, Inc., 2011. Virtue, Doreen. How to Hear Your Angels, California: Hay House, Inc., 2007.